Home / Cartoons / "and if only one percent of those people…"
The musician had pressed up 10,000 copies of his CD in anticipation of 10,000 orders that were sure to come through that week. He bought 10,000 padded mailers and mailing labels. He converted his garage into a big mailing center. The magazine issue came out, and… Nothing. He bought an issue. There was his ad. But the orders were not coming in! Was something wrong? No. He tested it. Everything was working. I hear less Chinese math these days. China has 1.3+ billion people. Even half a percent is a lot…. Ha! I’ve made that same mistake before, more than once. Love the last line… that really sums up the downfall of fantasy math. This is a common mistake of lots who have never been in business, etc. They have no idea exactly how ineffective (especially print) advertising is. 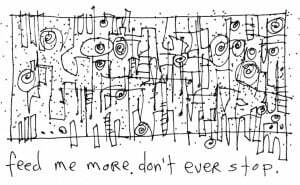 I have been reading gapingvoid for 3 years. The more I read the closer I get to buying a print (note he only really started doing them this way a year ago.) I will at some point. The point being that it sure does take a lot of different factors and points of contact blah blah blah to get someone to buy from you… and ONE print ad, ONE time- is rarely the factor. …and from the 7 comments left including this one I guess you won’t run out of prints in a hurry… Even if the ARE excellent. I’ll be back. This points to the simple fact that you have to offer something the public likes and will pay money for. I am always amused when some actor or director says that a movie flopped because it wasn’t marketed correctly or didn’t receive enough promotion. Yet, we hear of those crazy word-of-mouth phenoms that put the lie to all that such as the Harry Potter craze. If it is good and you put it out there, you will sell. If it isn’t good, you are simply screwed. Start over. Well, this is true of course. The more people see your ‘thing’ the more will act or participate or buy. It is just a numbers game. Some work better than others depending on the audience of course. If you sell fish and to promote to Japanese you will get more responses than if you promote to the Chicago bulls. This type of analysis was the bedrock of wacky dot-com business plans. The fundamental flaw was applying pre-Internet management instincts to Internet numbers. People saw the big numbers and then thought even at a small fraction of usual response/conversion/close rates, they would make lots of money. What they didn’t account for is that the denominator can get just as big in the world of the Internet making the fractions very tiny. Nonetheless, you still see this nonsensical analysis not only in naive, wishful-thinking start-up business plans, but also in big corporates. The big guys are obsessed with spreadsheets that easily fall prey to simplicistic assumptions devoid of connection to real world dynamics. Hugh, in my industry they are called “Magic Numbers”. 3) it’s a fight against laziness. Now, let’s make a product that sells! Analytics, projections and business planning aside there’s a simple issue that is glaring to me, the medium. Magazines are not the best sales channel for music (particularly if nobody has heard the music or of the artist). I’d have projected 0 sales on that one. He did good at 4. Personally, I am holding out for a desert manhattan or Marfa style print or perhaps even a commissioned print if I hold out long enough. Hugh, I hope that 1% of your readers do eventually buy a print. You can’t fault the musician for dreaming big. He was just unaware of how big his dream actually was. Maybe the number of people needed to complete the 1% do not have the avenue of making payments for your product even when they have the money. For instance, more than 200Million people can’t pay for goods online cos they don’t have and therefore can’t use a credit card.